Is Roger Stone the Link Between Trump Campaign and WikiLeaks? Newly uncovered correspondence involving two of the president's former associates appears to show that the Trump campaign was aware of WikiLeaks' plan to publish stolen Democratic Party emails before the 2016 election. According to The New York Times, former campaign operatives Steve Bannon and Roger Stone discussed a strategy that WikiLeaks founder Julian Assange had concocted to time the emails' release in a way that would harm Hillary Clinton's presidential bid. Just a month before voters went to the polls, Assange indicated that he planned to reveal some of the documents each week until Election Day. He allegedly obtained the emails from Russians who hacked the Democratic National Committee and Clinton campaign chairman John Podesta. Robert Mueller, the Justice Department special counsel investigating Russian interference in the election and possible collusion by the Trump campaign, recently questioned Bannon for several days. According to sources who read transcripts of the interviews, Bannon and two other former Trump campaign officials told Mueller that Stone claimed to have connections with WikiLeaks. 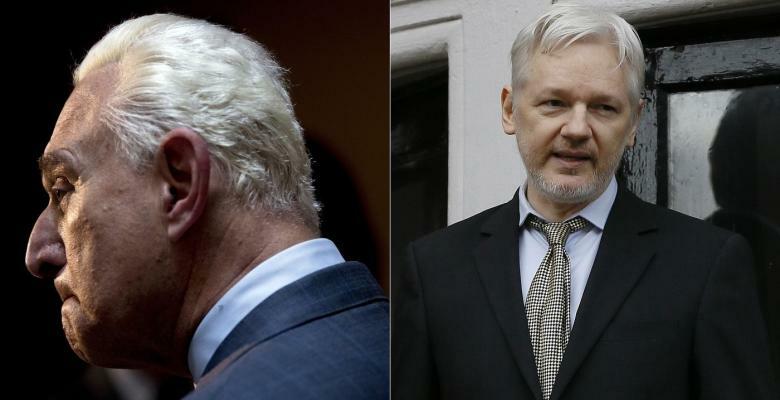 One of the witnesses reportedly recalled that Stone knew ahead of time what Assange intended to do, and boasted that he influenced the timing of the emails' release. Mueller added fuel to speculation that Stone is a target of the Russian investigation by subpoenaing several of his former employees and political associates to testify before a grand jury. The special counsel gave the witnesses the option of being interrogated by his legal team. Last year, Stone told the House Intelligence Committee that he had no “advance knowledge of the source or actual content of the WikiLeaks disclosures.” In a recent interview with The Washington Post, he insisted that he had never discussed WikiLeaks with other Trump advisers. The statements contradicted Stone's past text messages and emails, meaning that he may have committed perjury at the committee hearing. WikiLeaks published Podesta's emails on Oct. 7, 2016, a mere 30 minutes following the release of the infamous “Access Hollywood” tape on which Trump confessed to sexual assault. Assange apparently wanted to distract voters' attention from the scandal. Stone has since identified Credico as his link to WikiLeaks, though the New York City comic denies it. Credico acknowledges that Stone repeatedly mentioned his attempts to win a pardon for Assange. Stone tried to enlist Fox News commentator Andrew Napolitano, a former judge, in the effort, according to Credico. “I most definitely advocated a pardon for Assange,” Stone wrote in an email, adding that he had “most certainly urged my friend Andrew Napolitano” to help persuade Trump to grant the pardon. Credico said Stone also took credit for the president's pardon of Joe Arpaio, the former sheriff of Maricopa County, Arizona. Stone previously called for pardons of Trump campaign operatives Paul Manafort and Michael Flynn. Though the WikiLeaks founder faces no indictments in the United States, the Justice Department is investigating him for releasing classified documents and stolen Democratic emails. Assange has been under federal scrutiny since 2010, when WikiLeaks published more than 250,000 diplomatic cables.